Have fun learning to read the symbols of the Tarot for self-development and/or for other people. Discussion includes intentions, ethics in readings; use of prayer, Light, and “tuning in” processes; importance of working within Divine Will and for the Highest Good of all concerned. Class will provide opportunities to read for other people, as well as for oneself. 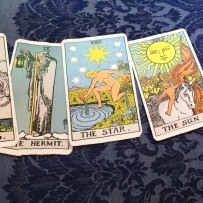 Instruction will cover each of the Tarot symbols. Several books will be recommended during class for you to read at some point, even after the course has ended, among them Tarot Revelations by Joseph Campbell. Taught by Laverne Hall in 1976, Karen has been reading the Tarot ever since and has read at numerous psychic fairs, Body/Mind/Spirit Expos, and gives readings each month at The Big Psychic Fair in Roswell and The Atlanta Metaphysical Center, as well as doing private readings. Bring the following book and deck of cards to the first class. They can be purchased at amazon.com or at The Phoenix and the Dragon located on Roswell Rd., just inside of I-285. If you don’t have these the first night of class, come on to class anyway. There are many decks and books, even other books on the Tarot by Eden Gray. Be careful to order these below specifically, as your learning will be easier if everyone has the same book and deck.